For many people embarking on a home renovation project, investing up to 20% of the budget in an architect is not an option they can afford. We take a look at how to undertake a project without an architect and the professional input you will need along the way. Whether it’s a planned new kitchen, a loft conversion or an extension, most people will at least explore hiring an architect to pull together the designs. The architect’s role doesn’t have to stop there; they can also help you obtain planning approval, appoint a builder, liaise with the other trades needed and project manage the whole renovation. It’s only when the costs come in that for some, even when limiting the architect’s role to producing plans, the price can represent an unacceptable chunk of their budget. For modest or straightforward improvements many experts are convinced that the services of an architect are unnecessary. If you can’t or don’t want to afford an architect, you’ll need to have a clear idea of what you will need to do and what experts you will need to engage to make your project a reality. Who can I ask to draw up my plans? Whether you need planning permission or not, you will need detailed scaled drawings of the current building and the changes you propose to show to the structural engineer, building contractor and other trades. You could consider using one of the many simple computer programs available on the market to produce your own early stage plan. Alternatively for more complicated plans you can ask an architectural technician – which is cheaper than an architect – to pay you a site visit, measure and provide your detailed drawings for you. Who can I ask to provide structural calculations? When you’re making home improvements that could impact the stability of the building you will also need a structural engineer to provide calculations and technical drawings which will be used by your building contractor during the renovation work. As a general rule anything which changes the structure of the property will need building control approval and to obtain this you’ll need to submit the calculations from a structural engineer to your Local Authority Building Control department before works can start. Projects which often require the services of a structural engineer include an extension, removing or changing internal walls, modifying doors and windows, loft conversions, removing a chimney breast and so on. How do I get planning permission without an architect? You don’t need an architect to obtain planning permission. You can submit your plans yourself online via your local authority’s website or in person. Having an architect submit your plans will not guarantee they are approved. If you know, for example, that your planned rear extension, is a replica of works next door that was approved last year, then it is likely your plans will also be approved. You can request a pre-application meeting with your planning department before submitting plans. It comes at a cost but may be valuable in understanding any possible issues with your plans which you can rectify before paying to formally submit them. This meeting and a little research should help you determine local planning restrictions, targets and preferences so you can tailor your project accordingly. If you aren’t confident doing this yourself, a good planning consultant might be an option to help you through this process. What other regulations do I need to comply with? For certain types of work – for example, electrical, plumbing, gas, and replacing windows – you need to get a building regulations compliance certificate from your local authority. A tradesman can provide your certificate if he is a member of a trade association which is registered as a government run accreditation programme that confirms that the work has been done in line with building regulations. For example, you probably already know that any work to install or adjust a boiler needs to be undertaken by a gas engineer registered with Gas Safe (which was formally known as CORGI). There are similar trade associations for window installers (FENSA and CERTASS), electricians (NICEIC) and so on. When searching for these trades ask up-front whether they can self-certify and get the relevant certification when the job is done. You will need this should you ever sell your home. Alternatively, you could go to your Local Authority Building Control (LABC) department to get approval for these works. Fees vary, according to the scale and type of work being undertaken as well as which part of the UK you live in, but are generally less than £500 for something like an extension. It is extremely important to discuss all proposed work with your LABC and building control service in advance of any work starting, as failure to meet regulation requirements can result in home owner liability for any remedial work that has to be done. In the absence of an architect it is vitally important to have somebody that you trust to oversee the building work. If you have used a structural engineer or architectural technician to draw up or check your floor plans, then ask for a recommendation. Alternatively, ask a family member or friend who have had building work done to share their experiences. We have partnered with Checkatrade to help you find a building contractor. When inviting builders to tender for your project it’s important to approach at least 5 in the hope of getting a response from 3 of them. Send them a letter inviting them to tender, including copies of your plans and technical calculations, and inviting them to attend a site visit at your home. Make sure their estimate includes a breakdown of the costs, is on company headed paper with full address and phone number and includes VAT. You will understand your project and the costs better if you spend time talking through their estimate. Remember a good rapport can be tremendously beneficial to achieving your goals. 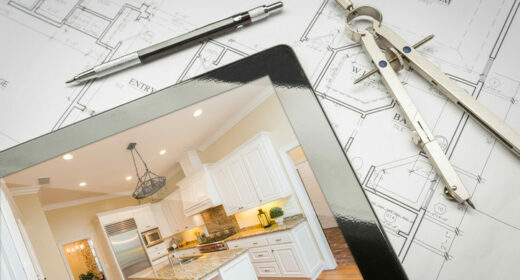 Managing a renovation project yourself takes a lot of time and energy. A schedule of works and payment schedule can be set out clearly in a contract with your building contractor. Asking your builder to sign a contract protects both you and them. Be aware that if you deviate from the original plans or want additional items added during the course of the project, you or the building contractor should get a cost before signing it off. Make the building contractor responsible for obtaining Building Regulation compliance for works done and final planning permission sign off and make sure you have all the certification before final payment is made.